Dunno about that book, but 'Scorsese on Scorsese' is THE book to get. It covers his life, his career, and pretty much every damn movie (depending on what printing you get). i havent read A Journey, but i read the other two and they were awesome. Journey is like Scorsese On Scorsese, in that it goes project by project in his filmography (up until Cape Fear), but it's told with additional ancedotes and comments by those also involved in each project - Schrader, DeNiro, Pesci, etc. In 1983, we had a long talk about his film The King of Comedy, a movie the studio was ready to give up on until some good reviews started coming in. For Scorsese, the making of the film coincided with a painful period in his life, a time when he fell in love with Isabella Rosselini, married her, and was divorced. Although it is easy to see The King of Comedy as the most barren and unemotional of Scorsese's films, that wasn't the way he saw it. "The amount of rejection in this film is horrifying," he told me. "There are scenes I almost can't look at. There's a scene where Deniro is told I hate you! and he nods and responds Oh, I see, right, you don't want to seem me again. I made the movie during a very painful period in my life. I was going through the Poor Me routine. And I'm still very lonely. Another relationship has broken up." "Since. I'm spending a lot of time by myself now. I go home and watch movies on video and stay up all night and sleep all day. If I didn't have to work I'd sleep all the time. I've never had such a long period when I've been alone." Toward the end of our dinner I discovered by accident how deeply he was hurt. I mentioned a new film named Exposed by James Toback, starring Natassja Kinski. I said I thought Kinski possessed whatever rare magic Marilyn Monroe had; that whatever Kinski appeared in, good or bad, she commanded the screen. "I can't bear to see Kinski in anything," Scorsese said. "She reminds me too much of Isabella. It tears me apart. I can't even go to see a film by the Taviani brothers, because Isabella and I had a little courtship on the set of one of their films. I can't even go back to island of Salina, where Visconti's The Leopard was shot, because we were there. In fact, I can hardly even watch a film by Visconti without growing depressed." "By memories of a period when I thought I was happy. I'll put it that way. A period when I really thought I had the answers." "Okay, then," I said, "I've got a new movie that can't possibly depress you or bring up any old associations. It's called Say Amen, Somebody, and it's this wonderful documentary about gospel music." "Can't see it." Scorsese was grinning, but he was serious. "It's distributed by United Artists Classics." "You mean you can't see a film that is distributed by a company that is connected to a movie you once loved?" He smiled. "I'd see the United Artists logo and it would ruin the movie for me." "Maybe you could come in after the logo had left the screen?" My parents' one moviegoing experience they've relayed to me countless times was when they sat in the same row as Scorsese and Rossellini to watch a film at a Colorado festival. I'll always look back at that memory differently now. Great story, I don't even mind that you keep switching from scorsese to scorcese. Hahah. 6 years old and still funny. Scorsese on Scorsese by Faber and Faber is a good start. It was my favorite Scorsese book for years, but something always felt missing - it felt a little too neat and tidy to truly reflect the Scorsese that I felt in his movies etc, the mad, film obsessed, passionate, heart on his sleeve, living and dying for cinema, type guy. 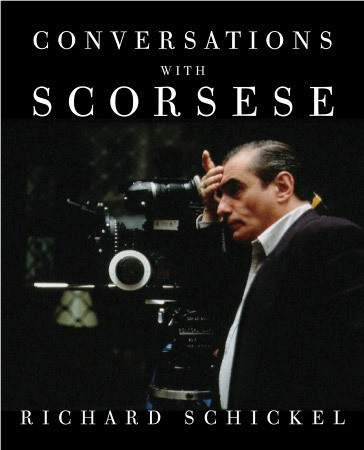 So then I bought the Scorsese Interviews book, and it's amazing. Very personal, intimate and frank about the filmmaking process. There's an amazing interview between him and Richard Price, amongst other amazing interviews. Last year I got the Cahiers du Cinema, Scorsese on Scorsese and again, very personal, with great photographs - lots of storyboards, script notes etc and two really interesting interviews with Thelma Schoonmaker on their process. I don't even mind that you keep switching from scorsese to scorcese. too old but still amazing. That is verbatim my Tinder profile.